It looks like wide receiver Dez Bryant will receive the franchise tag from the Dallas Cowboys if a long term deal cannot be reached between the player and the team by March 2. The cap is estimated to rise to 140 million for the 2015 season so Bryant would count 13 million on the cap. Cowboys executive vice president Stephen Jones says the team will try to get a long term deal done before March 2, but says he is leaning towards franchising Bryant. Bryant changed agents during the season and said he would be “highly disappointed” if the team chose to put the franchise tag on him. On the other hand, Jones does not seem to care about Bryant’s reaction. Jones had this to say. Thirteen million is a lot of money, but it is only for one year. This is Bryant’s first contract since his rookie deal and he is looking for a long term deal with more guaranteed money. Bryant did not hide his disappointment as he responded to a fan on Twitter. It has been highly published that the Cowboys fear giving Bryant a long term deal with a large amount of guaranteed money due to off the field issues. In July 2012, Bryant was accused of hitting his mother after a disagreement. Bryant reached a deal with the district attorney’s office to have the charges dismissed after his mother decided not to press charges. As a result, the Cowboys hired a full-time manager to be with Bryant at all times and he seems to have stayed out of trouble. After hearing about Bryant’s tweet, Jones shared the following thoughts. Jones’ response should make Bryant feel better about possibly being tagged, but the Cowboys need to make a concerted effort to meet with Bryant’s two agents and try to get a long term deal done for both sides. The Cowboys have been forced to be creative in the past and should set up a contract that guarantees Bryant more money than past offers as long as he meets an agreed upon behavioral expectation. The Cowboys need Bryant more than he needs them. He has proven he can stay out of trouble and is one of the top three receivers in the game. Why risk having Bryant not participate in offseason programs which is normally the route franchised players take as a way to show their displeasure. If the cap stays at the projected 140 million, the Cowboys would be 14 million under the cap BEFORE tagging Bryant. Tagging Bryant at 13 million leaves 1 million left to re-sign defensive free agents like linebackers Rolando McClain, Justin Durant, and Bruce Carter as well as defensive linemen Nick Hayden and George Selvie. This does not even take into consideration trying to sign reigning NFL offensive player of the year, DeMarco Murray. Why not sign Bryant to a long term deal that would definitely not count 13 million against the cap for next season? 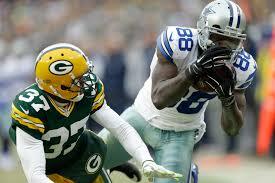 The Cowboys could choose to tag Murray which has been rumored to cost $10 million. This would allow the Cowboys to see if Murray’s season was a one year wonder since this was the first year he ever played a full season. Dez would be happy with a long term deal and Murray would be happy getting paid 10 million with the opportunity to prove he can stay healthy consecutive seasons. And that’s… as I see it! Please visit The Game Day Report at http://thegamedayreport.com for more of my articles and those by other writers on a variety of trending topics in the sport’s world. « Should People Read into Pettine’s Comments Regarding Manziel?